There’s never been a better time to be a kombucha lover. The fermented tea-based drink has overtaken the grocery store, edging out coconut water and sparkling switchel to claim an entire aisle for funk. It’s a brave new world of beverages, with brands hailing from Portland, OR, Portland, ME, and everywhere in between. But in this heavily saturated, highly carbonated market, one brand has stood out to me for its nuanced flavors and conscientious sourcing: Yesfolk Tonics kombucha feels totally fresh. Yesfolk founders Yiyi Mendoza and Adam Elabd are trained herbalists who have experimented with fermentation together since 2012. (Elbad has even authored a book on the matter, Fermenting Food Step by Step.) The couple’s process is rooted in respect for ingredients and a deep knowledge of fermented foods, often derived from their own Mexican and Egyptian heritages. Their family-run microbrewery in upstate New York is located in a converted church—a fitting location for producing such ethereal drinks. Frank Mendoza, Yiyi Mendoza, Adam Elabd and Javier Mendoza in the converted church where Yesfolk is brewed. Still, choosing cans wasn’t just a matter of aesthetics. Aluminum cans are recyclable and lighter than the typical glass kombucha bottle, so they require less fossil fuel for transportation and are easier to carry around. (For now, Mendoza and Elabd hand-deliver their tonics to wholesalers across New York state.) While bottles can let in trace amounts of light or air, which can affect fermentation, Yesfolk’s cans are tightly sealed to preserve the drink in its peak. Once that bottle is cracked open, the first sip is a lesson in what kombucha can be. My favorite flavor is yaupon, a plant native to North America that’s rich in caffeine and theobromine. It tastes of dried sweet desert mint and tangy guava, and the little bubbles of carbonation roll across my tongue. Osmanthus oolong kombucha is silky and peachy, and Yesfolk’s water kefir, a dairy-free ferment pairing wildflower honey with hibiscus, chamomile, and calendula flowers, is even more aromatic. These tonics can be tracked down at bagel shops, yoga studios, and cafes throughout New York state, with more locations serving soon. Those overcrowded kombucha aisles better make some room—that distinctive Yesfolk can is coming for them. Buy Yesfolk in stores throughout New York state. In Going to Bed with…, we talk to the people we’re crushing on about how they wind down before going to sleep. Now that “plant-based” is a wellness buzzword, it’s easy to forget that veganism was a perfectly conventional, even unremarkable way to eat for generations. “People think that veganism is for the rich, but our people have been eating this way forever,” says Amy Quichiz, the 23-year-old founder of Veggie Mijas, a New York–based collective of women of color dedicated to hosting vegan dinners and promoting healthy living through an intersectional lens. “We bring awareness to how folks can eat healthier and how every member of our community can have access through SNAP (The Supplemental Nutrition Assistance Program, aka food stamps) and food pantries,” explains Quichiz. Quichiz’s mother is Colombian and her father is Peruvian; she grew up in Queens, eating mostly Colombian food and staples like corn and sweet potatoes. In the time since Veggie Mijas started, she’s helped the network grow to include chapters in Los Angeles, Miami, and Philadelphia. This Thanksgiving, local organizers in Chicago are hosting a Friendsgiving potluck to celebrate indigenous resilience. Along with guided breathing exercises and plenty of food, the event is a reminder to “listen to the indigenous community, provide resources, and be gentle with our triggers and traumas. It means celebrating our resilience, our strengths and our weakness and being there for one another,” says Quichiz. Between her Veggie Mijas duties and a day job at a sexual health center, Quichiz knows that it’s important to take care of herself before helping others. On any given day, you can find her perfecting her feel-good bedtime routine, which usually involves trap music, skincare, and comfort food. Here’s how else she calls it a night. I listen to Locatora Radio, hosted by two great femmes of color, Diosa and Mala, who live in Los Angeles. It’s all about creating radical movements and documenting our legacies. I also listen to Radio Ambulante, an NPR special, where folks from all over the world tell their incredible stories of survival. Most of the time, I cry a lot hearing stories about Colombian women losing their children in environmental or borderland displacements. I love listening to both because there is a balance between reality and escapism. When I’m in my room, I turn the lights off, put on my disco lights, and dance all my stress away. I dance for like an hour. Currently I am listening to Por Ti and No Me Encuentras, by Tatiana Hazel, a Chicana artist from Chicago. I also dance to MIA by Bad Bunny and Drake, and of course, all of the Isolation album by Kali Uchis. I try to write in my journal. I journal every other day and have been writing diary entries since I was 6 years old. I try to write out how I feel, what’s going well, what’s not going well, just so I can have that record. I also like to read Love Poems by Pablo Neruda. Before I go to bed, I wear a face mask. I really love this one called Face to the World by Loba Loca, a queer South American migrant artist. Whenever I shower, I place some herb powder on my palm and rub it lightly on my face. It’s oatmeal based, scrubbed with tonic and cleansing organic powder herbs. I also love the Milk Jelly Cleanser, Mega Greens Galaxy, and Moisturizing Moon Mask from Glossier, and the Cup o’ Coffee mask from Lush. I place my face masks in the freezer alongside my pink jade face roller and wait 20 minutes before putting it on. The coolness of the jade gets rid of that extra stress. Quichiz dancing the stress away. On difficult days, I let myself cry. I also do meditation. I lay out my yoga mat and practice a few breathing techniques and play soft music. This is a moment when I give recognition to myself and God for allowing me to have another day in this life. Before I go to bed, I always prepare myself a Yogi Bedtime Tea. My girlfriend uses the Figuier scented Diptyque candle, which I love because it smells like a warm winter and makes me want to cuddle and go to sleep. I love coming home and wearing my “Dressed To Chill” sweatpants from Chillhouse. They are so cute and the softest, most comfortable thing to wear after a long day. This story is part of the Healthyish Guide to Sunday, a compilation of recipes, suggestions, and obsessions to make the first day of the week your favorite. My favorite part of every night is the moment when I turn on my white noise machine. 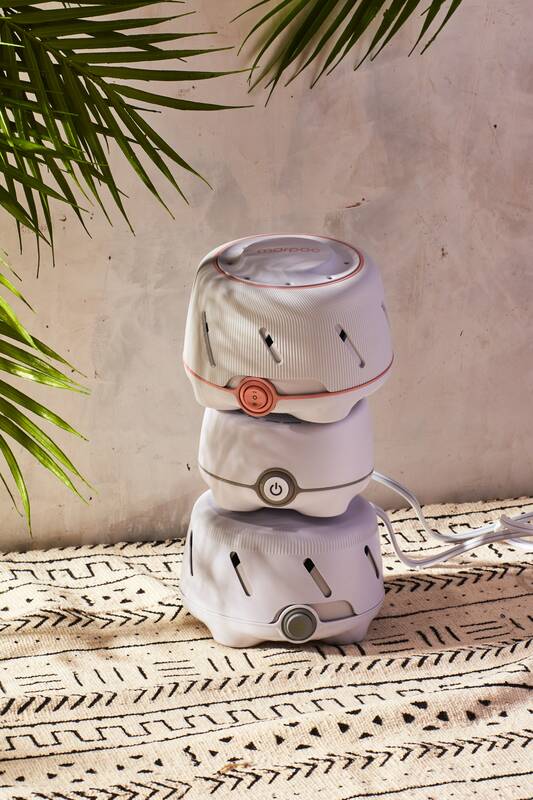 It’s a small, cute, round, unassuming fellow—a compact white disc in hospital off-white with an o-shaped power button— who sits on the floor near the bed, with an anthropomorphic appearance that makes it seem like it should do a lot more than it does. But I don’t need a robot assistant and what the white noise machine does do—the production of whooshing, exhaling nothingness that drowns out the noise from the street below—is more than enough. The sound pads my bedroom like a cotton ball, absorbing the chaos of the world outside ( *whispers*…was this what it was like in the womb?!). With the white noise machine doing its thing, retreating into my room feels like going on vacation. Something about its consistent comfort makes my bed softer, my pillows poofier, my anxious thoughts duller, the lights dimmer. It makes me feel like I’ll find fancy, individually-wrapped soaps in the my bathroom and shampoo and conditioner I can’t afford in the shower. Am I wearing worn-down socks or velvet slippers? Is that a small chocolate I see on the pillow? Is sleep within my reach? This illusion is the greatest gift I could ask for from a machine so teeny! I grew up sleeping with a white noise machine, which my parents purchased when we got a puppy who whined through the night and they didn’t want me to do the same. I abandoned the machine during my adolescence and forgot about its existence throughout high school and college, so sleep-deprived that my eyes would be shut before my head hit the pillow. But during my first autumn in New York, when I no longer powered on the window unit air conditioner at night, I realized just how quiet—but also how maddeningly loud—my bedroom (and every single thought in my head) could be. Without the whir of the A/C, there was eery silence, interspersed by shrill police sirens, cars blasting music, the occasional hubbub on the corner, and, come 3 A.M., the never-ending meows of my two cats, ready for breakfast five hours too early. I bought the compact, one-speed Dohm Uno from Marpac to replace the A/C shhhhhh-ing, unknowingly repeating the story of the company’s beginning: Marpac originally branded their white noise machines as “sound conditioners” in 1962, when Jim Buckwalter found that his insomniac wife, Trudy, was able to fall asleep in motels thanks to the lull of the A/C. And while the classic sound of a natural white noise machine is just that—the strum of a diffuse fan—fancier electric models are programmed with ocean waves, tingling chimes, or running streams. Personally, I like the placeless-ness of the white noise: I don’t want to be somewhere; I want to be nowhere at all. Most of the time, when the white noise machine is on, I am not. That, I think, is the whole point. But on relaxing days (or days that are supposed to be), I like to bring my book, my knitting, and some snacks onto my bed long past wake-up time and keep the machine running. A lolling Sunday morning spent in the cocoon of the white noise machine, temporarily tuned out from the chaos of my kitchen sink and world at large, makes it easier to face the loud messiness come Monday. Buy it: Dohm Uno White Noise Machine, $31. It’s Get Organized week! Over the next few days, we’ll be highlighting the products and methods we use in, out, and around the kitchen to get our lives together. The first question people ask me when they walk into my kitchen is, “Where did you get that dish rack?” It is definitely the biggest thing in my kitchen, but no matter how many dishes are piled inside of it, my simplehuman dish rack looks neatly organized like it’s part of a stock photoshoot. Plates and bowls are shingled in their designated spaces along the back, frying pans line up in the middle, glasses and mugs hang securely off the side, and sharp knives stay handle-side up in wooden slots. And even with all of that, there’s still room for items like a mandoline, clean leftover storage containers, and a cutting board without hitting capacity. For most of my adult life, I had the standard, cheap plastic dish drying rack that I had to replace at least once a year because it got mildewy, moldy, or cracked in half. Then a few years ago, I decided to splurge on the simplehuman dish rack I eyed at Bed Bath & Beyond at least six times before committing. It was stainless steel and shining in the aisle, and since I hand wash all of my dishes (dishwashers are unicorns in budget-friendly New York City apartments) I needed space to dry them all. I bought the $80 dish rack with a 20 percent off coupon, registered it for its five-year warranty, and have zero regrets. But even if you have a dishwasher, I highly recommend getting this larger rack (19.8″W x 17.7″L x 13.3″H), because you’ll inevitably have to hand-wash things like your Dutch oven, fragile ceramics, and wine glasses. 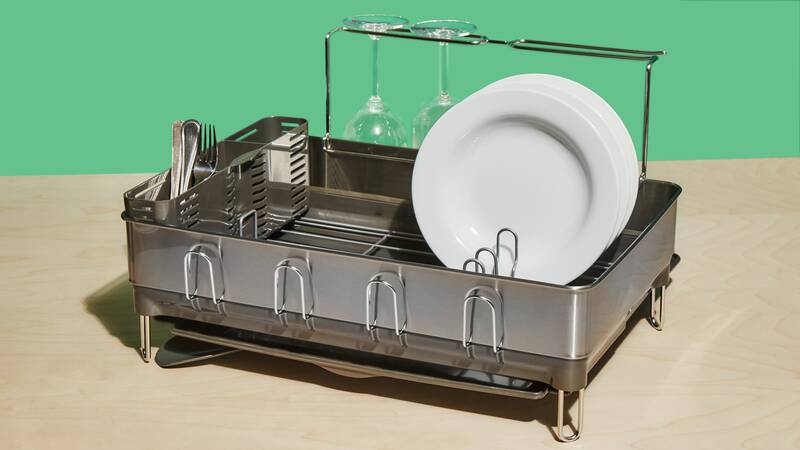 It’s literally thought of everything: The drip tray is expandable and can slide to the left or the right of the rack. There’s a swivel spout that looks like a water slide so you can aim residual water right into the sink (you can put the rack on either side of the sink this way). The wine glass rack can hang even XXL wine glasses upside down by the base of the stem. Oh, and there’s an anti-residue coating on the plastic tray so water spreads and dries more quickly, making sure there’s no gnarly build-up or weird smells coming from your rack. To be honest, I haven’t cleaned it in the nearly two years that I’ve owned it… and it looks almost as good as new. I wipe the outside down when I clean, but it has a fingerprint-proof, rust-proof finish so I don’t have to do much. As anyone whose come to my house and casually mentioned the piece now well knows, this is the Cadillac of dish racks. But if you think it’s too big for your kitchen, simplehuman also makes a compact version (11.9″W x 15″L x 8.9″H) that is slightly smaller and $30 cheaper, but I say go big or go home. It’s an investment in the illusion that you have your life together, and impressing people is priceless.